The shooting dead of a top Tamil Tiger and five others has raised fears that Sri Lanka could return to civil war. E Kaushalyan, a rebel political leader, is the most senior Tiger killed since a ceasefire began in February 2002. Sri Lanka's government has condemned Monday's ambush, saying it increased the risk of a return to conflict. The rebels, who blame the attack on paramilitaries working with the army, say it is a major blow to peace efforts. The army denies involvement. On Tuesday, Chandranehru Ariyanayagam, a Tamil former member of parliament who was travelling with Mr Kaushalyan, died of injuries sustained in the attack, which took place in government-controlled territory about 40km (25 miles) north-east of Batticaloa. Four colleagues of Mr Kaushalyan, the rebels' political chief in the east, were also killed. Three others, two of them policemen, were injured in the shooting. 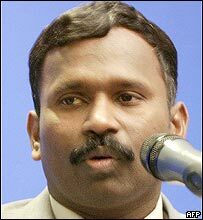 The Sri Lankan authorities deny having anything to do with the attack and say they suspect supporters of a renegade Tiger commander, Colonel Karuna, who split from the rebels in March 2004. In a statement the government said the killings were a violation of the ceasefire. "The government calls on all concerned parties to prevent further violations of the ceasefire, gravely risking a return to conflict, and instead to support the peace process and move ahead," it said. The statement said the timing of the attack was "clearly calculated" to disrupt improving relations between the government and the rebels after rifts over the distribution of aid to survivors of the Asian tsunami in December. Security forces have now been placed on alert in eastern Sri Lanka amid fears that the violence could put pressure on the already fragile peace process. Peace talks stalled in 2003. The rebels have warned that the attack represents a major setback to the process and blame military intelligence and paramilitaries. "Definitely it is going to [cause] severe damage between the parties," S Puleedevan, a senior rebel political leader, told Reuters news agency. The military denies any role in the incident. "In no way are we involved," spokesman Brigadier Daya Ratnayake said. Scandinavian peace monitors say the killing is the most serious setback since the ceasefire. 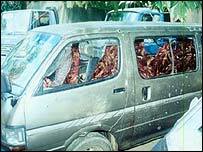 Mr Kaushalyan was travelling from the rebel-held town of Omanthai to Batticaloa when his vehicle came under attack about five or six kilometres from the nearest army checkpoint. Police are investigating the shooting incident and have not said who they think carried it out. "This attack was planned ahead and was carried out with precision," Inspector Saman Perera told Reuters. Since the split between Colonel Karuna and the Tiger leadership, there has been an upsurge of violence in which government and rebel supporters have died in the east, although the month since the tsunami saw a brief lull. More than 60,000 people have died in violence in Sri Lanka since the rebels began their fight for a homeland for minority Tamils in the island's north and east.